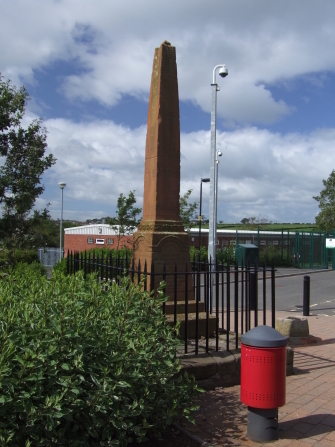 A total of four memorials commemorate the five martyrs - the oldest is a flat stone of 1830 located beneath the obelisk of 1885. An old stone and a modern copy are located in the modern portal nearby. 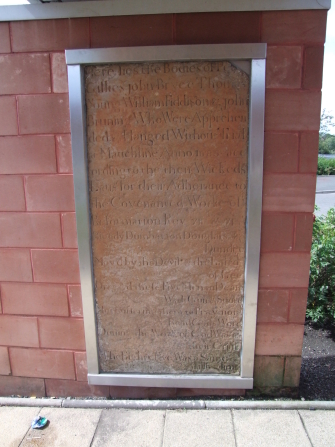 Peter Gillies of SKirling and John Bryce of West Calder were captured and tried before Lt Gen William Drummond at Mauchline and sentenced to be hanged on 6 May 1685. 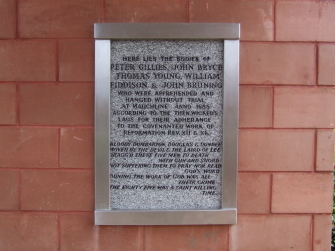 They were hanged alongside John Browning, William Fiddison and John Young, the latter two belonging to Carluke. Browning had been active at the rescue at Newmilns Tower.